Review: The original Prey, that came out in 2006, was a game that had been in considerable development time, it was positively reviewed but didn't quite make an impact. This new version is a re-imagining of the Prey premise, and not a sequel. it's heavily inspired by System Shock, which again Bioshock was inspired by. Although Prey is set on a space station it has a clear artistic inspiration from Bioshock and plays very much like it. Metroidvania type exploring with new areas unlocked after abilities that make it possible to backtrack and open them. A great premise for a solid game then? Absolutely. 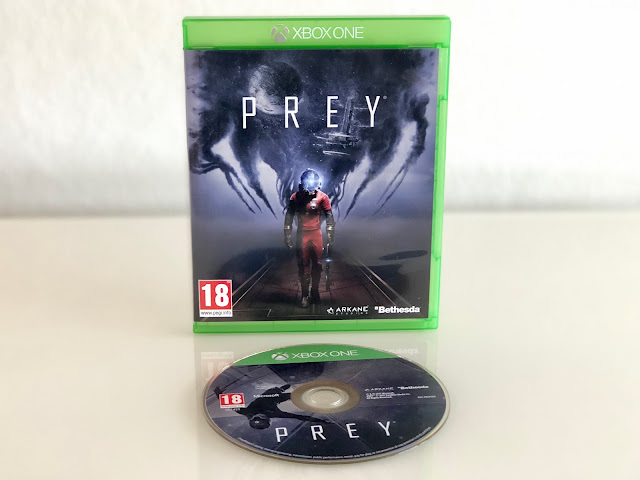 But once again we see Prey failing to capture the interest of large sales numbers, but that only means that you can pick this up for a bargain! Prey's beginning level sets the tone of the game and instantly throws a plot twist onto the player. It's a neat way to quickly get the premise and setting of the story out of the way, while still retaining a shocking and revealing moment. Set on a seemingly abandoned and huge space station, you quickly realise something has gone terribly wrong. The enemies are quickly introduced; shape shifting and aggressive aliens called the Typhoon. They're part of some experiment going on in the space station. This shape shifting ability gives way for some neat jump scares; suddenly a chair can change into an alien and start attacking. Gameplay is close to Bioshock too; at first you rely on a wrench(! ), then obtain guns and after a while you have the ability to scan and learn more power related attacks from the aliens. These powers work much like magic in a traditional RPG, letting you fire massive energy blows to enemies across the room etc. Combining these attacks are key and of course searching every little drawer and shelf for ammo, food and parts to build new weapons and upgrades. Although you could call out the game at being almost copycatting Bioshock, I personally didn't mind. It's a good game to be inspired by and Prey outdoes it's inspiration with more options and a far deeper gameplay system anyhow. I loved wandering around the space station, travelling from a main hub to various areas such as laboratories, sleeping quarters, indoor forest areas and offices. There's always a main goal to complete and follow, but alongside there are lots of side stories with individual goals. The artstyle is beautiful too; with a classy retrostyle to the design, often blended over to high tech and modern areas. It's a great sight to behold and the non-gravity outside areas feel intense and lonely, further immersing the player in a beautifully designed world. I really enjoyed soaking in all the atmosphere of the specstation, simply because of the great design that's gone into it. Prey is a tough game to finish, it's difficulty is much like Bioshocks; unforgiving at times. Prey even more so, there are some areas you encounter such hostile and numerous enemies you wonder if you ever will be able finish the game. But stick with it and you become the master of collecting the right ammunition and using the right abilities to fight through. My main letdown of the game was perhaps the rather short and should I say "typica" end to the game. I kinda liked it, but it could definitely have been fleshed out with more substance at the end. Like Bioshock though, the story tells itself throughout the game and the more you explore, the more you are rewarded with a deeper layer of knowledge of the story and what has previously gone on at the spacestation. This type of storytelling requires the player to use their imagination and try to get a feeling of the atmosphere. Much like how the diary entries in the old Resident Evil games on PS1 worked. All in all, a must-buy for fans of Bioshock or lonely space settings. It's a fantastic first person adventure which begs the player to sink into it's fascinating and creepy atmosphere. The difficulty is hard, but rewarding and forces the player to alternate attacks and learn new methods. Exploring is key and definitely a nice change of pace from shooters rushing from A to B. One of last years top five titles and a warmly recommended game for those seeking a lengthy and well designed world to sink hours into. I found the progression of the story and gameplay well structured, keeping me interested until the very end. Do this commercially sleeper hit a favour and buy it!